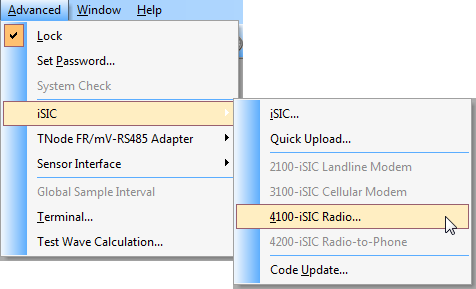 Setting a 4100-iSIC or SDL500R as a Repeater - NexSens Technology Inc.
NexSens 4100-iSIC and SDL500R data loggers communicate using 900 MHz spread spectrum radio technology. This telemetry has a limited range, which can be extended by using one or more repeaters. To setup a radio data logger as a repeater, follow the steps below. 1. Open iChart without a current project. 2. If the update will be performed over the air through the base radio, proceed to Step 3. If the update will be performed through direct connection of the logger to the iChart PC, the data logger’s connection type must be temporarily changed from TTL (radio) to RS-232 serial for this procedure to work correctly. Click here for instructions on establishing a direct serial connection with a 4100-iSIC or SDL500R. 4. 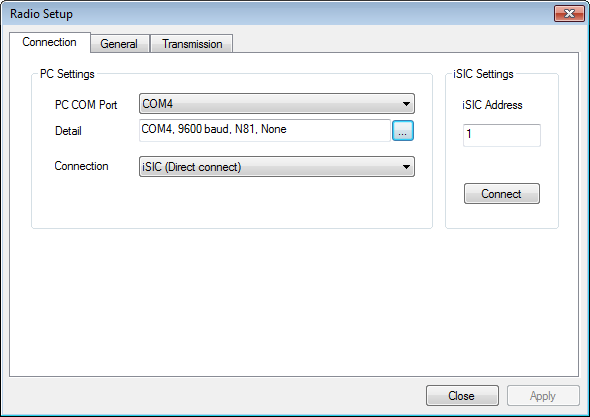 Select the PC COM port that is connected to the data logger or base radio (depending on connection method) and select the appropriate Connection type. 5. Type the address of the 4100-iSIC to be set as a repeater and click Connect. 6. Once the Connect button changes to Disconnect, click the General tab. 7. Check Set Operation Mode and select Repeater. 8. Click Apply and wait until an acknowledgement is displayed. Confirm and close. 9. If the logger was temporarily set for direct connection, cycle power to the logger to restore the original operating mode.